Julia Powles’ new series of paintings present ambiguous spaces packed with jostling marks and shapes. Major and minor forms compete for ascendancy within the borders of the canvases. Slabs of opaque colour float up to eclipse other, translucent, areas. In some works, hard-edged components are occluded by elements resembling empty speech bubbles, from which all voice has been left unsaid. They billow in from the edges like inscrutable clouds, portending unknowable incidents; they are like the memory of old conversations, or the breath between words – as vitally important as the sentences it falls between. Loops and trailing lines describe shapes, or otherwise float freely across the various depths within the canvases, offering a lyrical playfulness. Occasionally, colours describe their own shapes, whilst in other areas the paint exists more as a floating sensation. 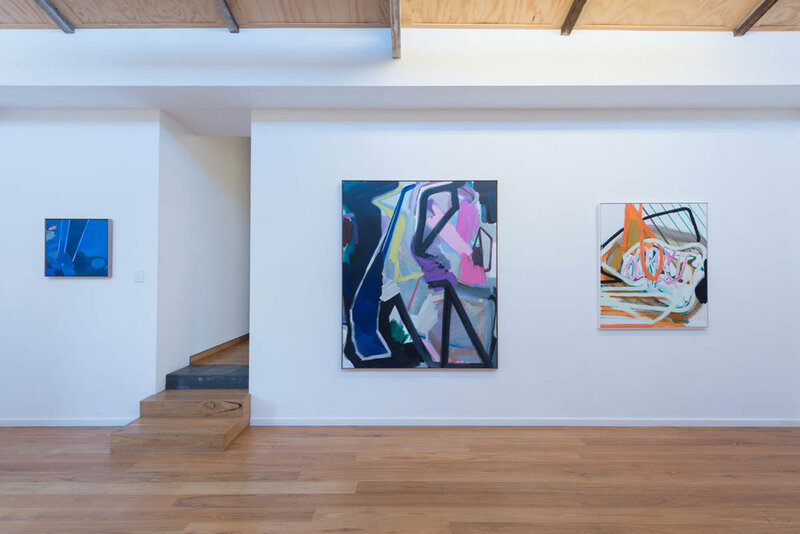 Working intuitively, and allowing a stream-of-consciousness approach to inform the works, Powles engages in a highly-charged intellectual skirmish with the canvases. Elements emerge or are subsumed during the process until the final state is arrived at. These are paintings about the act of Painting itself. Every fluid slip and flow of the brush; every conjunction of solid, formal device with suggestive, atmospheric passages evoke for the viewer an evocative, self-contained realm. Sometimes tough, sometimes whimsical, always engaging, the paintings of Julia Powles invite the viewer to contemplate a highly-original, distinctive set of painterly inventions by an artist at the top of her game.